Since the Firm’s establishment, it has honored growth. 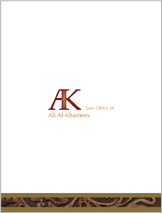 Firm’s team is committed to provide bilingual legal services in English and Arabic to Kuwaiti national organizations and international organizations in UK, USA, GCC and Arab Middle East countries, conducting business in the state of Kuwait. The Firm is resourced to provide legal services in various consultations, establishing, reviewing contracts, agreements and legal services related to commercial and investment litigations that arise among companies, and in relation to the International commerce, Tenders, customs. Media, communications, finance and banking, investment funds, Intellectual property rights, local arbitration, mediation and process of collection debts services.